All Plastics and Fiberglass, Inc. offer both fiberglass and polyethylene tanks. Please contact us when you need a tank and we will impress you with our capabilities. 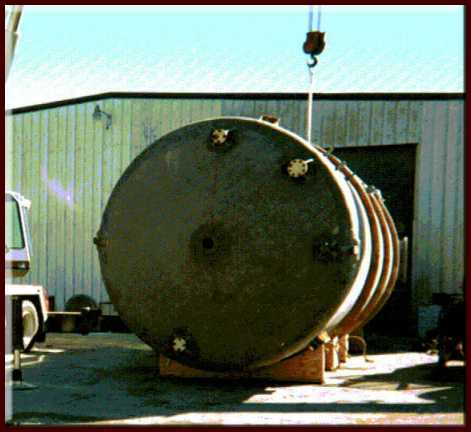 Our extensive experience in design and fabrication of Fiberglass Reinforced Plastics ( FRP) tanks give us the ability to fabricate tanks up to 50 ft in diameter. Our engineering services and computer aided design capabilities combine to bring high quality solutions to our customers' corrosive and processing challenges. Our tanks are manufactured as per ASTM 4097, ASTM 3299 and PS15-69 standards, to meet customer satisfaction. Our manufacturing methods include hand lay-up and filament winding to satisfy customers' requirements. 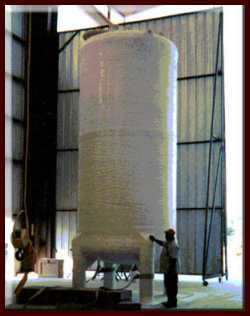 Quality filament wound or hand lay up fiberglass tanks of varying sizes are custom manufactured at our Mobile facility. Standard mandrel diameters are 2", 2 1/2", 3", 4"', 4 1/2", 5", 5 1/2", 6", 6 1/2", 7", 8", 9", 10" and 12". Large diameters of greater than 12 ft and up to 50ft can also be custom manufactured at our facility. Our abilities include designing and fabricating fiberglass tanks of any configuration and service conditions to meets our customer requirements. Our FRP tanks last longer because they are manufactured for the specific service condition like temperature, chemicals, pressure or vacuum, and environmental loads. Our Upright tanks are available in crosslinked polyethylene in sizes ranging from 30 gallons to 14,950 gallons. Some sizes are available in linear polyethylene. Other Upright Tanks that we manufacture include Upright Storage Tanks with IMFO (Integrally Molded Flanged Outlet), Upright Storage Tanks Molded-In Side Manways, Sloped Bottom Upright Storage Tanks with IMFO, and Upright Storage Tanks with Double IMFO. Our tanks provide intelligent and economical choices with long term unmatched performance. Our Open top tanks are available in sizes ranging from 55 gallons to 14650 gallons. 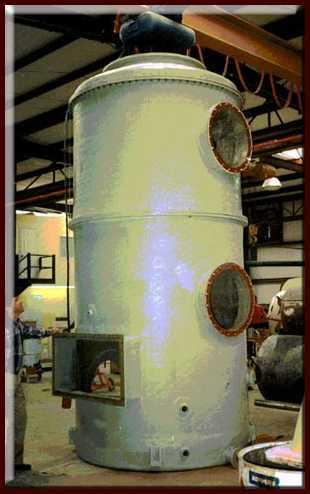 Tanks diameters range from 1'-11" to 14 feet. We manufacture Open Top Storage Tanks with IMFO, Sloped Bottom Open Top Storage Tanks with IMFO, Upright Open Top Tanks with Double IMFO, and Enclosed Containment Tanks. 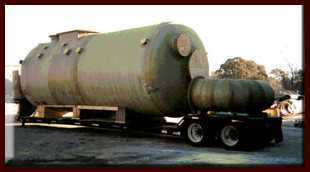 Our tanks offer many advantages over tanks made from stainless steel and mild steel. Crosslinked polyethylene SAFE-Tank systems range in size from 55 gallons to 8,700 gallons. Transition fittings are available to move the product through the sidewall of the system. Dome fittings are also available. Some system sizes are also available in linear polyethylene. Horizontal cylindrical tanks range in size from 12 gallons to 4,150 gallons and are available in high density crosslinked polyethylene or linear polyethylene. Saddles are required for support of these tanks. We also manufacture Horizontal Elliptical Tanks, Horizontal Leg Tanks, Horizontal Sectional Tanks, and Elliptical Sectional Tanks. Cone Bottom tanks are available in closed-top and open-top design: they range in size from 16 gallons to 10,950 gallons. Metal stands and baskets are required for proper support. Many sizes are available with a molded-in drain (IMFO). Seismic stands are also available. Some other types of cone bottom tanks that we manufacture include Cone Bottom Tanks with 30Â° Slope, Cone Bottom Tanks Open Top, Cone Bottom Tanks Open Top with 30Â° Slope, and Cone Bottom Tanks Dry Material. Our Company offers secondary containment basins in both cylindrical and rectangular styles.